Perfectly balanced due to the Titanium coated feather light design. The Schmidt Titanium Capless Rollerball is crafted in Germany. The pen is perfectly balanced due to the Titanium coated feather light design. The spring loaded security clip automatically retracts refill for pocket safety. Super performance capless refill system. 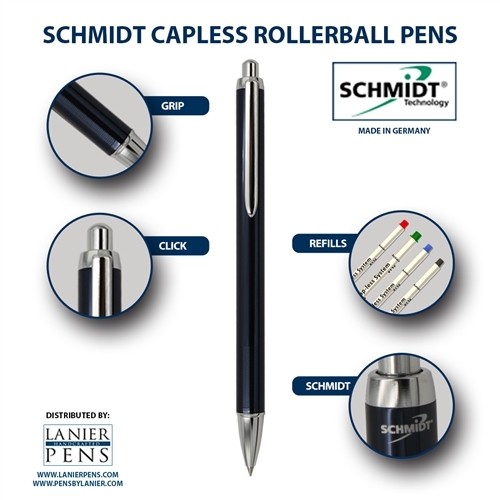 Schmidt produces these delightful click-top one piece rollerballs to inexpensively introduce consumers to their capless ink technology. We've added these pens in five colors simply because they are a screaming deal. The sturdy pocket clip contains a retracting mechanism to assure you don't 'pocket' the pen with the tip exposed,Pretty cool. 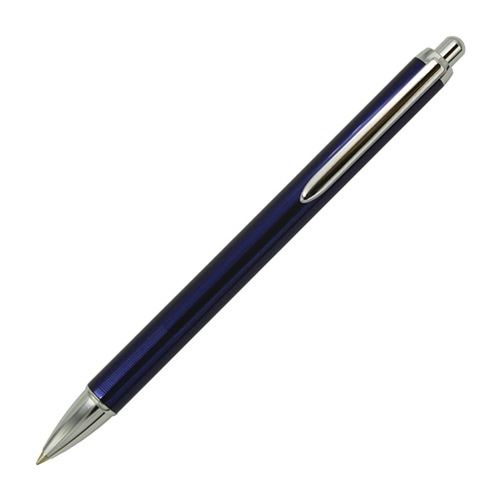 This click-top pen uses Schmidt's ceramic ball technology; smooth writing doesn't get any better than this. Oh, wait, it does! 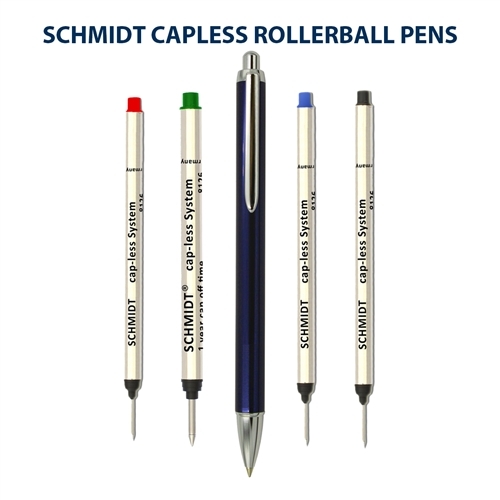 Schmidt just introduced this rollerball refill in additional colors and point sizes. Choose your refill in black, blue, green or red which are all offered in fine. The black and blue is now available in fine, medium or broad points. It Feels comfortable in your hand especially for the smaller hand. Would make a perfect gift. 0.6 mm Medium Rollerball Tip For Sharp, Distinct Lines. Sleek Capless Design Features A Smooth, Comfortable Grip. Rich liquid Ink Writes Smoothly Without Skipping. The Schmidt Rollerball Is Precision-crafted In Germany.